Sources claim Toyota will give the green light. Instead, a 1.6-liter turbocharged four-cylinder is a likely possibility, to which Kanei added "can be interesting.” So when will the Corolla GRMN hot hatch arrive? Kanei believes it’ll be midway through the model’s current production run, so within two or three years from now is fairly good estimate. He also believes the chassis development process should go fairly quickly, but it’s the powertrain that’ll require a decent chunk of time. So now we know you’re asking yourself whether or not the Corolla GRMN, or whatever Toyota will name it, could head to the US. Although nothing has been confirmed for now, Toyota has not ruled out the possibility. After all, the standard Corolla hatchback is currently on sale in the US and it’s already receiving solid reviews. Why not add some spice and bring in more favorable press coverage and, above all, buyers? Makes sense to us. 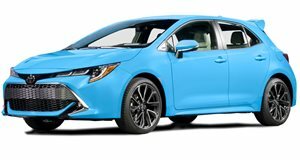 Another question to ponder: if the US were to receive a Corolla hot hatch, would it be identical to the one sold overseas? Could Toyota potentially change the powertrain to, say, a hybrid one in the belief that it’ll attract more buyers? At this stage anything is possible and Toyota reiterated it plans to study each market accordingly.